Not a big fan of Easter. To me there is something disturbing about a bunny hiding eggs to lure kids behind bushes with the promise of candy. But I have to put away my Easter Grinchness for the kiddos. I saw a Pin about string Easter eggs. Some just for decoration and some with treats inside for children. One Pin used a fabric stiffener on the string another used a flour/water mixture. I happened to have flour and water so I went with that Pin. 2: Mix flour and water. 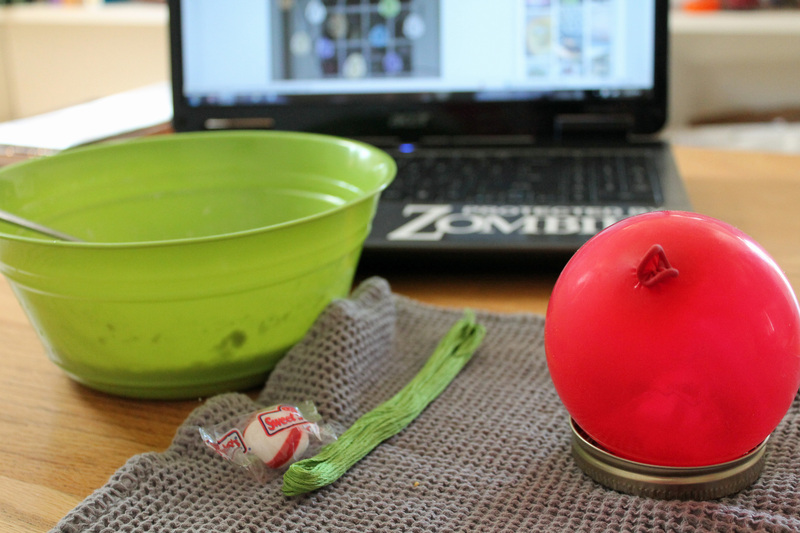 3: Cram candy into deflated balloon. 4: Blow up balloon to desired size. Go small. 5: Soak a long piece of thread in mixture. Okay let’s take a moment. The pin looked like after soaking the thread you just start wrapping it around the balloon. Yeah…didn’t work for me. The thread just kept sliding off the balloon causing a chorus of bad language to spew forth from my mouth. So I spot a canning jar from another pin project. 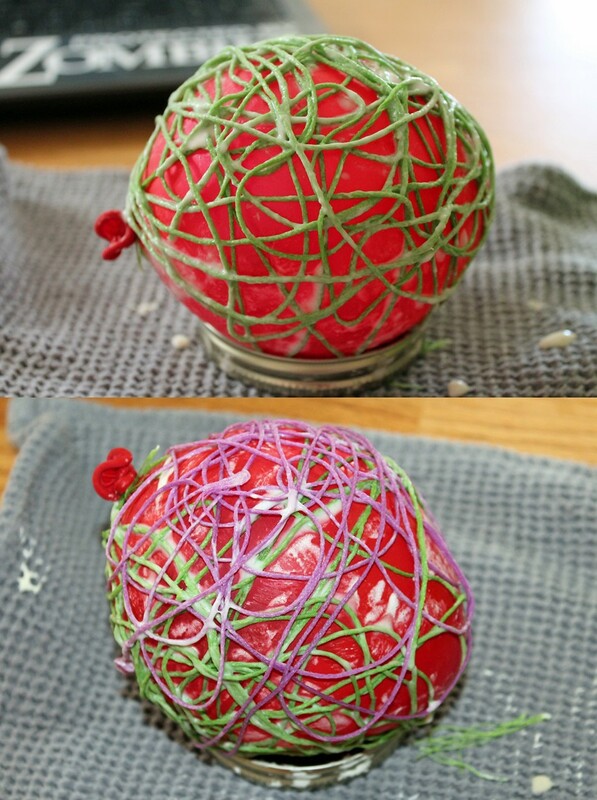 A light bulb moment: the lid will make a perfect stand to hold the balloon. 6: Sit balloon on lid to free up both hands. 7: Take soaked string and just randomly cover balloon. I was only able to do one side at a time this way. Give the wet section a little time to dry before rotating. Remember once you pop the balloon and remove it you will have candy inside so make sure all your holes are small enough to keep the candy from falling out. You might be asking why I glooped (technical word) so much flour paste on the thread. That was the only way I could get certain parts to stay put. 9: Wait forever to let it dry. 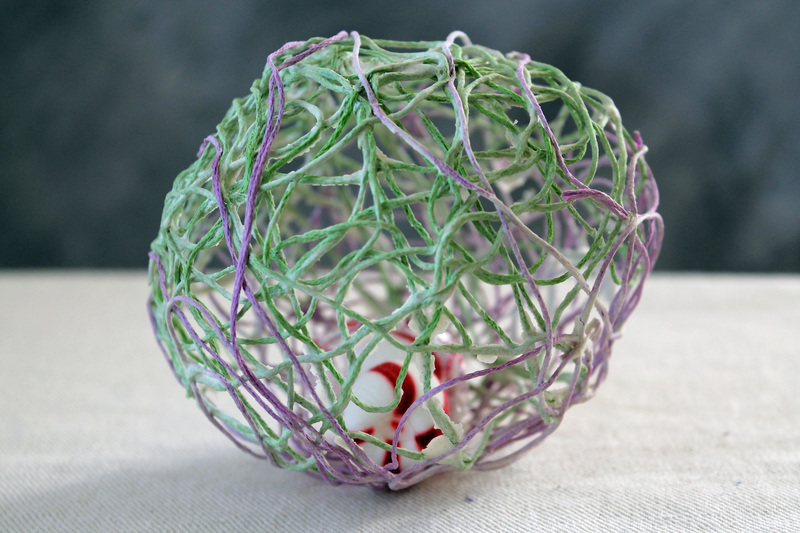 10: Watch Resident Evil while you wait for the string egg to dry. So I’m watching one of my favorite Zombie movies while the drying process drags on. While watching I think about this past Fall when I planted a Zombie and Halloween night where I became an Umbrella Corp scientist cooking up the dreaded zombie virus. While we wait for the egg outcome I will share these two projects with you. While on Pinterest I stumbled upon a cute little pin. 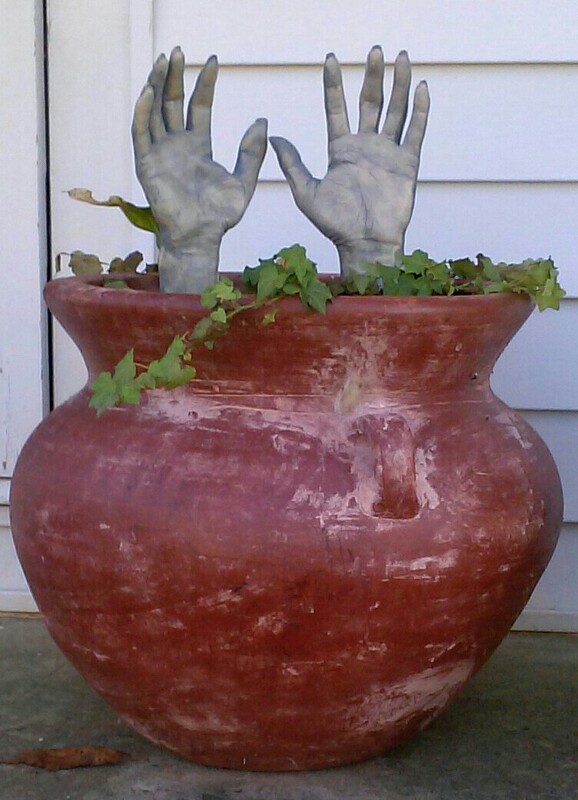 It was a little flower pot with a zombie hand planted. I said to myself, “Self, you can do this but it needs to be bigger.” I totally agreed with myself. Here is mine. Yes it is true. Bigger is better. Every Halloween I dress as a zombie. Do my own make-up. Go to work covered it latex pieces I made with itchy blood and make-up on. So I awake at 4 a.m. to apply make-up. Wear make-up until eleven that night, sometimes even later. This Halloween I decided that was more then I wanted to commit to. So If I wasn’t going to be a zombie I was going to be a zombie creator. 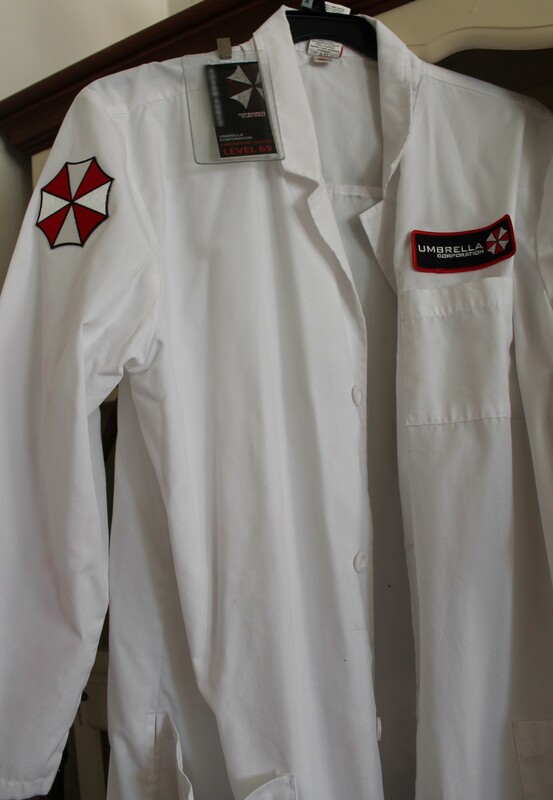 Off to Amazon I went, a week later my lab coat arrived followed by my Umbrella Corporation patches. A little ironing, some safety glasses and a security pass…Ta-da! 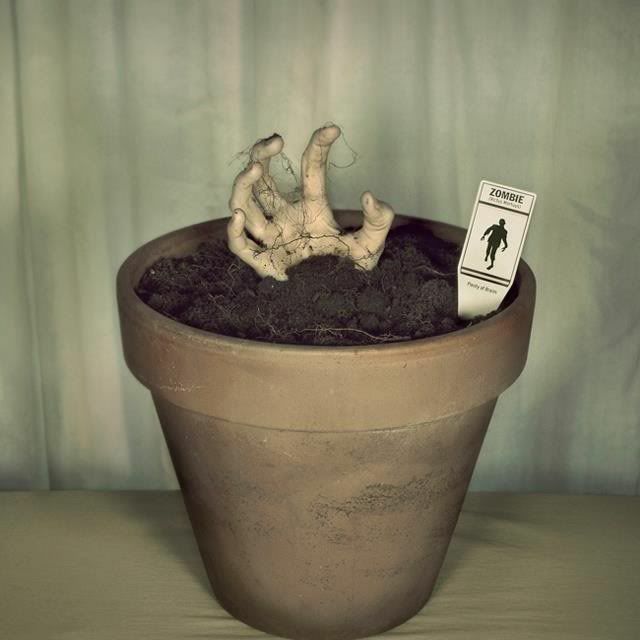 I am a scientist that creates the zombie virus that wipes out mankind. So for the moment you have been waiting for, the Pin outcome. Getting candy out of a balloon that’s in a string egg is not a fun time. I tried to cut the balloon in half to get the candy out in doing so I managed to cut the wrapper off of one the candies. It seems flour paste was not a great choice. The string was now a dull flour coated mess. The egg is fragile, handle with care. I do not have any photos of the balloon removal process. It was late at night and all my concentration was on not breaking the damn egg. Somehow during this time I fell over the kitchen chair. That people is true love at its finest. In his defense if I was being attacked by a person and not an evil chair he would have helped me fight off the attacker…I think. I used the four/water method because I did not have any fabric stiffener. Going to buy some for just one little project is just insane. Would I do this project again? Sure if I ever have some spare stiffener lying around. Now I have this pack of balloons looking at me, begging to be used. I have the perfect Pin for those bad boys. So off on another Pinteresting adventure I go. Until next time, may the Pin be with you.